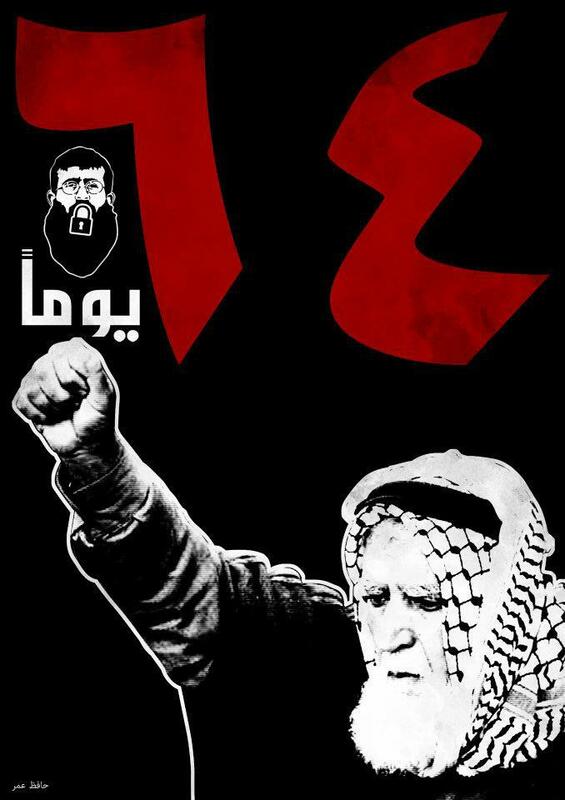 Khader Adnan has been on hunger strike for 64 days now and his will remains strong. He has chosen his dignity over his hunger. Today, Israel’s High Court of Justice scheduled a petitions hearing for Adnan, scheduled for Thursday, February 23. The petition was filed on February 15th but the court has not treated the situation with the urgency it requires. The High Court of Justice was provided with a medical report by an accredited Israeli doctor (Physicians for Human Rights- Israel) which confirmed that Adnan is “in immediate danger of death” and that “a fast in excess of 70 days does not permit survival.” February 23, the day of the hearing, will be Adnan’s 69th day without food. The 33-year old father of two young girls, whose wife is pregnant, has lived his entire life under the omnipresent oppression of the Israeli occupation. His hunger strike began one day after he was arrested from his home, in the terrorizing style of a night-raid, while his wife and daughters looked on. That was December 17, 2011. His hunger strike began the next day and continues today. He received no charge, and was not even informed of a reason for his arrest. Rather than confusion, Khader Adnan was facing a process he has grown to be familiar with: administrative detention. Administrative detention is arrest without trial or charge. Evidence is not disclosed for “security reasons”. A period of detention can last 6 months, but can be renewed indefinitely. Some detainees have been held for up to 8 years. The practice as such is illegal under international law. It is a shame that his story has not made headlines globally, so we must take it into our own hands to spread his message far and wide. There has been a petition circulating via Samidoun for a while now: sign here. Two days ago, Amnesty also set a petition: take action here.